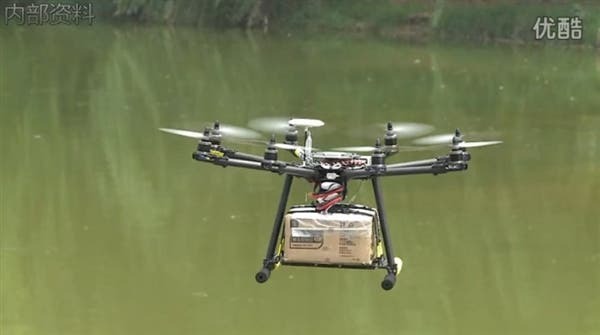 Chinese parcel courier testing UAV drones to deliver your packages! China is made up of tall, towering skyscrapers which for a parcel couriers must be a nightmare, but one company may have found a solution by using UAV drones. SF courier service (probably the best courier in China) is currently testing the us of UAV devices to deliver small to medium-sized packages. The idea is that the it will save time to fly the radio control quad-copter up to the window of the customer rather than having to walk up the stairs or wait for the elevator. The UAV SF are testing is a suped-up version of the more common quad-copter with 8 powerful rotor offering enough lift to carry a weighty package. Test flights have proven that the drone is easily capable of delivering goods, however issues with the noise it creates, health and safety (reaching out of a 15 floor window to get your parcel) and obvious issues with unmanned drones flying around cities need to be addressed.